Will the Rabbinical Council of Victoria agree and accept this policy? The flowering of Torah study and teaching by God-fearing Orthodox women in recent decades stands as a significant achievement. The Rabbinical Council of America (RCA) is gratified that our members have played a prominent role in facilitating these accomplishments. Therefore, the Rabbinical Council of America. Commits to an educational effort to publicise its policies to its members and community. I don’t know how sexual preference defines a sub culture or philosophy of Jews or Judaism per se given it crosses all groups anyway. They should be afforded full support by the JCCV and indeed the Council of Orthodox Synagogues of Victoria (COSV) in the face of issues which they face, and pastoral/other assistance but their membership extends across the existing sub groups, I would have thought. Services to assist I fully understand and support, but I don’t understand a grouping that defines itself by its sexual preference. For this reason I don’t understand why they need or want a formal membership separate from existing groups. As far as Orthodox Shules are concerned, I’ve personally not encountered anyone being called out or excluded or insulted because of a sexual preference. Of course, I stand to be corrected if that has occurred especially in the last ten years. It comes therefore as a surprise to me that apparently Caulfield, Brighton, Blake Street, North Eastern, East Melbourne and Kew Shules will all be voting in favor. I imagine the others will either not be present or abstain or go on ‘walk about’. The COSV is pretty much a toothless tiger, and on a matter such as this, they should consult the Rabbinic Council of Victoria as well. For an Orthodox group(s) I would express disdain for acts which highlight someone’s sexuality and/or take action verbally or otherwise against such people. I think that’s a given in our society. Is it not? That being said same gender KIDDUSHIN cannot and will not ever be supported by Orthodoxy. That also needs to be made clear, and certainly by Sam Tatarka, Danny Lamm and other orthodox members of the JCCV. There can be no hiding or diplomatic sweeping under the carpet of this axiom by simply not mentioning it. I have been ill with a virus, consumed with the Gaza operation and all the news surrounding it, and yet, I most certainly knew that this 23-year-old Yeshivah student, who was hiking with friends near Yad Vashem, had disappeared in the Jerusalem forest. I had read it in the Israeli papers. I read it in the Jerusalem Post, Yediot, Times of Israel and I’m sure more. Was it a secret? No? We all knew about it, and it was on the front page over a few days. And yet, in another example of Charedi ignition, we are exposed to a shrill article in Matzav, which not only asserts that the Israeli media ignored the disappearance, but probably did so because he was Charedi. The first point is patently false. When I first heard about it, my immediate reaction, call it a gut feeling, was that he had lost his way and was dehydrated somewhere. This is not the first time in recent times that a Charedi kid has tragically died in avoidable circumstances. Perhaps his phone battery was low, or it was a kosher phone unable to connect to the internet for a distress signal, but not having water when you hike appears to be more common among Charedim. Aharon may have had water. I don’t know. It’s baffling. What I do expect though is that a proper educational approach take place where Yeshivah boys are warned and re-warned, that you don’t travel without a charged phone which has a way of sending a distress signal, and you must have water with you. Will such obvious advice be splashed on the walls all around Israel’s Charedi enclaves? I don’t know. I sure hope so. If they don’t it’s questionable whether the Rabonim should be held to account according to the Din of Egla Arufa that we just layned. No doubt, we will hear one of “God’s accountants” who says that it happened because he wasn’t in the Beis HaMedrash. I sincerely hope not. 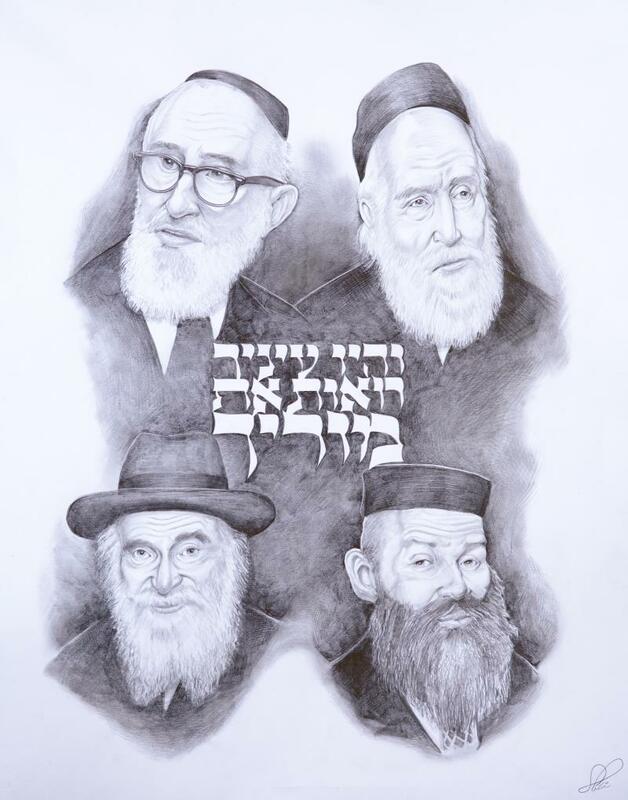 The Rebbes and Rabbonim who went to Marienbad and similar to get some Menuchas HaGuf were also not in the Beis HaMedrash, and it is entirely acceptable to take a rest and have some fun Bein Hazmanim. In Israel of course, based on the Medrash?, walking 4 cubits suffices to acquire Olam Habo! I guess according to Satmar and other Hungarians that statement is whitened out. I’d like to turn this issue on its head, from a Melbourne perspective. Yesterday, in light of the fact that a few days had passed and he hadn’t been found, it was planned to have an evening of Tehillim in the Adass Hall. The poster was politically correct. It also mentioned that the Tehillim was for the “matzav” in Eretz Yisroel. My questions were, for the “Matzav in Eretz Yisroel” there had previously been no such poster let alone a call to the Rabbinic Council to lend their approval. A boy of 4, Daniel, had just tragically been killed in a mortar attack. The Rabbi of Adass will not allow a Tefilla for the welfare of the soldiers of the IDF (Tefila L’Chayalei Tzahal) to be said in his Shule! The automatons follow this ruling. Yet, when a boy from Lakewood, who tragically met his demise becoming lost while hiking, the “Matzav” in Eretz Yisroel gets a sudden call up. I ask, where was the picture of little Daniel whose parents were in the midst of Shiva. Where was a call to divide the learning of Mishnayos for Daniel’s soul? There was not. You see, Daniel, wasn’t wearing a Yarmulke and his parents were Kibbutzniks so his Neshama wasn’t important enough to make a brouhaha and cause a kiddush Hashem by using this night to also divide the learning of Mishnayos. Why do the Rabbis of Lakewood in Melbourne and those from Adass ask for support from the Rabbinic Council of Victoria (RCV) if they consider that council to be something akin to a Chabad dominated circus of ignoramuses? Let’s not kid ourselves. They have no respect for the RCV. Perhaps my cynicism is greater than ever, but for me, every soldier, child etc who is killed is a human tragedy. Whilst the RCV had an evening of prayer (twice, I believe) and whilst some Charedim attended, most did not and would not. No, Matzav.com, the argument goes the other way, why does it take the untimely tragic death of a Lakewood boy to spur the Charedi world to organise a special night of Tehillim for the community. The answer is, I believe, that Aharon was frum. He was learning. Soldiers protecting lives and little boys killed by mortar are on a “lower madrega”, one which doesn’t call for a special gathering. Ironically, who visited family Sofer to give them encouragement? It was the Dati Leumi mother of one of the three boys kidnapped and murdered by terrorists. In summary, who could have a problem with an Asifa to say Tehillim for a missing kid, but to effectively make differences between frum and not yet frum is distasteful. Let me also remind my Charedi friends that there was a soldier who went missing for days and days and was ultimately found dead. The strong rumour is that abuse when he was a child led to his untimely death. Again, I can’t remember the Charedi Lakewood or Adass communities organising, let alone getting the RCV involved, to publicise their event for that tormented soldier. I’m sorry for those Charedim who send me unnamed comments telling me I’m fostering Sinah. People, wake up. The Sinah is perpetrated palpably not by me, but by the actions of hypocrites who love non Charedi financial support in terms of business and donations, but think we are second-rate. Well, I don’t accept being considered a second-rate citizen: neither Rav Shach or Rav Kotler was my Rav, and I don’t follow the anti Israel views of R’ Yoel of Satmar. We are in Ellul. A bit more Ahavas Yisroel is needed. Tonight there was meant to be a community Avos uBanim program. Adass not only said that they aren’t participating, but they actually removed the posters advertising the event, lest one of theirs is “led astray” and sits and learns with his son in a large room with those who don’t follow the closed Hungarian Charedi world. Shame on them! I will finish with a most sincere wish that Aharon’s parent’s are blessed with nechama, and the resultant trauma doesn’t consume their lives, בתוך שאר אבילי ציון וירושלים. I can’t even begin to imagine their pain. How can Rabonim be more respected? At the door of Rabbi Kennards comments (and he wasn’t engaging in a debate with Rabbi Shochet, by the way), is the feeling that Rabonim are undervalued. Rabbi Kennard is certainly not undervalued, although I must admit to misgivings that he seems to have timed some of his Shiurim at the same time as Rabbi Sprung on Shabbos, and given the clientele I’m not sure that this has helped Rabbi Sprung’s position. In my opinion, one of the outcomes of being non judgemental and displaying extreme Ahavas Yisroel, is the tendency to become an event organiser who portrays and executes feel good sessions. Certainly people need to feel good. Certainly people need to feel that they are Tzelem Eloki, and there is little doubt in my mind that they will not feel that acutely or even moderately (except through general mentchichkeit) through the Litvish/Misnagdish approaches, where they are, in the end, “not there” and really not valued (unless they have oodles of money to donate). The key to respect is two words: Limud HaTorah. As much as one tries to enfranchise Jews in the experiential, one must remain grounded. There is so much, and such varied material in Chochmas HaTorah that our youth, young adults, and young marrieds that they have not been exposed to, it is critical that there is a renaissance in that arena. To be fair, Rabbi Kennard must not sleep. His contribution is outstanding and welcome. At the same time, I know of countless Rabonim who do not engage in the basics of Limmud HaTorah. Sure, they are of the view that Tanya and Chassidus will open doors. They may, but they need a solid foundations. I am often astounded at the lack of basic knowledge many so called frum people have in common Yahadus. I stress common. The Ramash, for sure, never advocated the abrogation of Nigleh. Chassidus was the crème de la crème. The RCV should get serious and set a basic set of benchmarks. Pre-packaged Shiurim are definitely not the answer either, as beautifully produced as they are. Nobody looks at Aleph Beis, and knows to point in a simple Kitzur Shulchan Aruch. Want it spicy? Add Sheorim Metzuyonim Bahalacho. When I have guests, I get some great questions. I had a couple once who saw me come home from Shule wearing my Zeyda’s Gartel. I will cherish that all my life. They asked what it was. One could give the more esoteric answer of separating the top and the bottom, but the belt achieves that too. It would be better to start from the Gemora in Shabbos (I think) that introduces this custom, and explain how it is manifest, and eventually show that it is as dear to me as their grandmothers’s Gefilte fish. If Children do not see their parents refer Rabonim for their Keser Torah as opposed to slap on the back “you are a great guy and we love you” solely, I fear we won’t achieve the respectful Mechallel Shabbos who ran with embarrassment and hid when he was smoking on Shabbos and saw the Rabbi in the distance. I heard a drosha on Shabbos. It was nice, but I felt the use if secular writers on their own, to support a notion, was disingenuous. There were explicit Chazal that said these things well before, and they also expanded on them. Let’s not be embarrassed about Chochmas HaTorah and it’s Kiyyum Hamitzvos. It is this which comprises the ultimate Mitzvah of והלכת בדרכיו and it is this which will see us in utopia כהרף עין. Let’s not bicker. Lets contribute, as one. Author pitputimPosted on February 24, 2014 Categories EducationTags Diversity, Excellence, Rabbi Kennard, Rabbi Sprung, RCV, Torah4 Comments on How can Rabonim be more respected? Rabbi Kenneth Brander is beyond reproach. He has done probably 1000 times more for victims of abuse and beyond than our own Captains of Morality, and is well-known to be absolutely rock solid on moral issues, such as abuse. Yet, we have the Tzedek organisation, in a move which can only be described as approaching the level of the disgraced site run by Scott Rosenberg, expressing “concern”. To be sure, Rosenberg’s site, like Tzedek, performs some good; but it is an amoeba with an anti-Orthodox (especially Chabad) agenda. It isn’t at all dispassionate about fact finding, and is often twisting and sensationalising headlines like a desperate journalist trying to bring down organisations. Unlike Rosenberg, though, I would have expected Tzedek to have done its own solid research before they dare cast any real “concern” about Rabbi Brander. Tzedek have been tardy. If they have anything of substance, apart from discredited articles from the Forward and elsewhere which we can and have all read, then they should put up. Otherwise, let them shut up, and spend their time in the holy task of supporting victims and unmasking actual predators and their supporters. Does Tzedek think the community are a pack of fools who need their imprimatur in order to determine moral issues? Do they think that the community and individual Shules haven’t seen the badly researched, journalistic hooey, flashing in neon lights? Rest assured, that members of this community involved in overseeing this visit include many people and Rabbis who are at least as moral, sensitive and aware as Tzedek, but perhaps less inclined to hang people on the basis of unproven innuendo or use over-inflammatory language. Yes, it is true, that some have not (thank God) been victims themselves, but you do not have to be a victim to loathe predators or support those who might come to you for help. I have personally seen current correspondence from arguably the most respected professional experts in this arena, who are very well acquainted with a situation in which they support Rabbi Brander unequivocally based on personal knowledge of the facts. 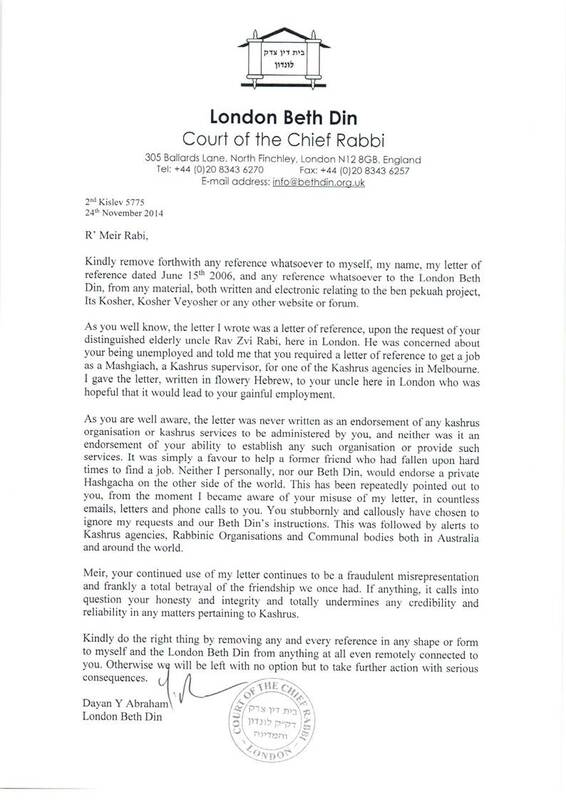 Rabbi Brander is not only to be looked up to; he has demonstrated many times that he has zero tolerance for those who wish to sweep such issues under the carpet. He has demonstrated this many times in his career, well before it became de jure to do so. Tzedek would do a lot better to actually engage Rabbi Brander in an hour of private discussion. They would be most surprised, and less inclined to issue their “letters of concern”. I have every confidence that they will be most impressed and enthused. Life isn’t that simple though, and forming a “connection” between Rabbi Brander and the current civil proceedings over past issues at YU is, frankly, beneath contempt. Is everyone at the Yeshivah Center a supporter of predators because of past sins and ills? Of course not. If they are, then there are people who are directly or indirectly affiliated with Tzedek that can equally dubiously be accused of such “sins of association”. Tzedek—many in this community do not consider you as our soul or sole moral compass, even though we admire many things you do. We do not consult you in respect of who we should and should not invite to our shores. We have our own access to facts and research, that you simply may not have, nor have discovered. As long as you sit on the outside and do not work within roof bodies all of whom equally abhor abuse, you are in danger of eventually becoming less relevant. I urge anyone who can attend any and all of Rabbi Branders’ Shiurim and colloquia to do so, and this includes members of Tzedek. This is a unique opportunity. Disclaimer: it was originally my idea to have the Centre for the Jewish Future invited to Melbourne to aid Orthodox congregations and organisations in order to re-enfranchise ever increasing Jewishly unaffiliated youth to the holy covenant of Torah and Judaism.